For a long time now, I anticipated arriving to the end of the Americas, on my bicycle, with Paul. Well, more days and medical news on Paul’s foot, put me in the hard position, to stay, or to go for what may be the last adventure on this long distance bike tour. “Last”, because I had to narrow my options down to a last event. I can’t continue to travel comfortably, financially, and most of all, I must get back in touch with my friends and family in the States. So, I went to Puerto Montt by bus, and stayed with a Warmshowers host, Sebastian. 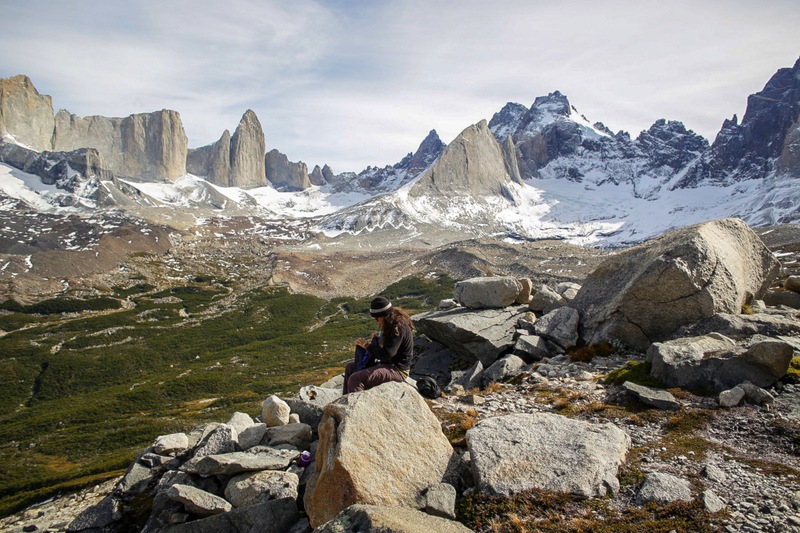 It was a few hectic days of scrambling to get proper wifi connection, so that I could make money transfers, emails and buy a plane ticket to Punta Arenas. After that was all squared away, I got to the airport, early, with only my backpack to check in. But foolishly, I showed my MSR cooking stove to the LAN airline reps, just so they were aware that I had a “clean” gasoline free container to check in. Big mistake, because the slight smell of gasoline on the canister walls did not meet-up to their security standards. Fortunately, two Italian cyclist were unpacking from a flight. I didn’t have to explain much, they already were sympathetic and gladly took my stove to leave with their Puerto Montt host. Grazie mille, Melissa and Pierluigi! I arrived to Punta Arenas airport at night. At the guards suggestion, I slept at the airport, in a corner of a closed dining room. Eight am, I took the bus to Puerto Natales, and booked a room in a hostel, where I met two nice German backpackers, Sarah and Jork. 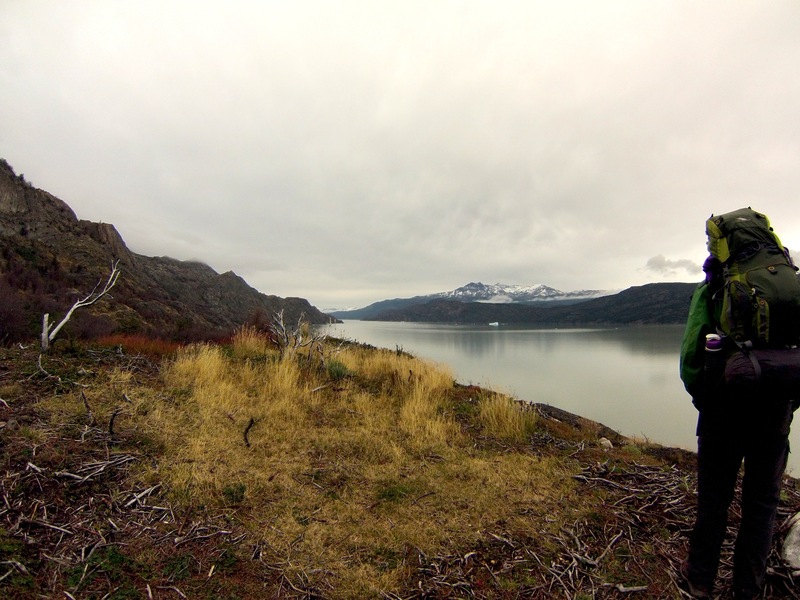 The weather in Puerto Natales made a frightening impression that we picked the worst time to be in Patagonia. Rain and intense wind continued from morning into the night. 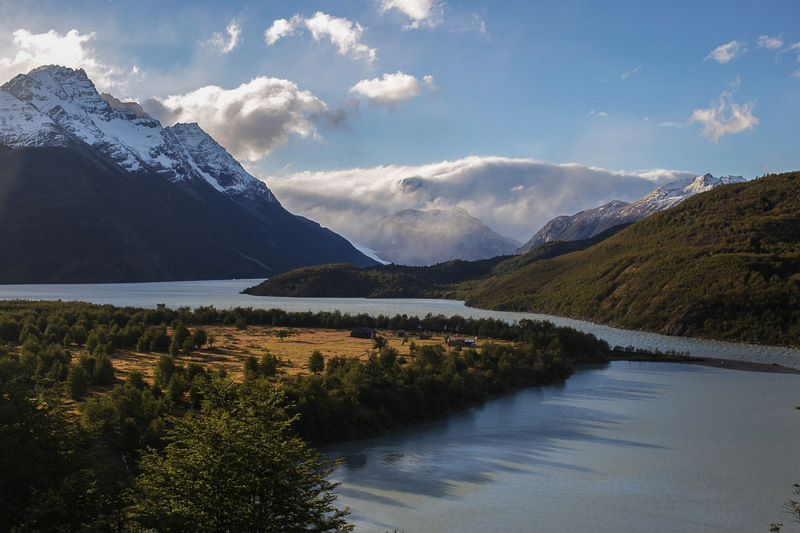 But they say, that the weather is unpredictable in Patagonia. 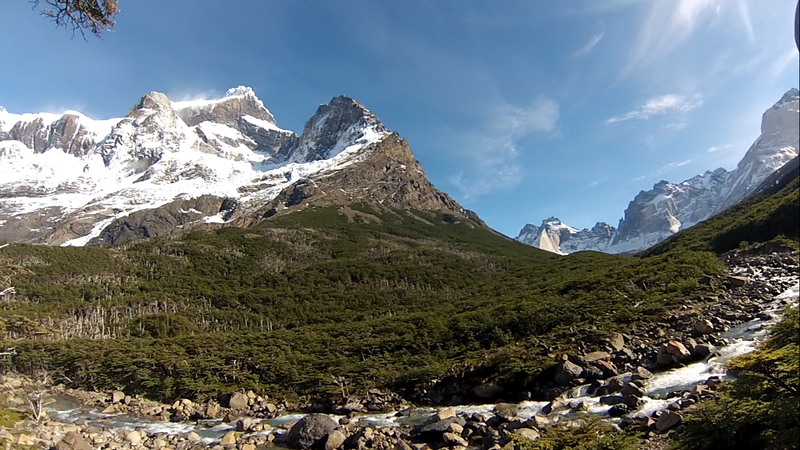 The next day we boarded a bus, which brought us to the gates of Torred del Paine, on a sunny late afternoon. I camped with the Germans, for that first night. They tried to get me to walk with them on the “W trek”- I was tempted because I liked their company. But, I was not going to pass up making the full circuit, the “O”. 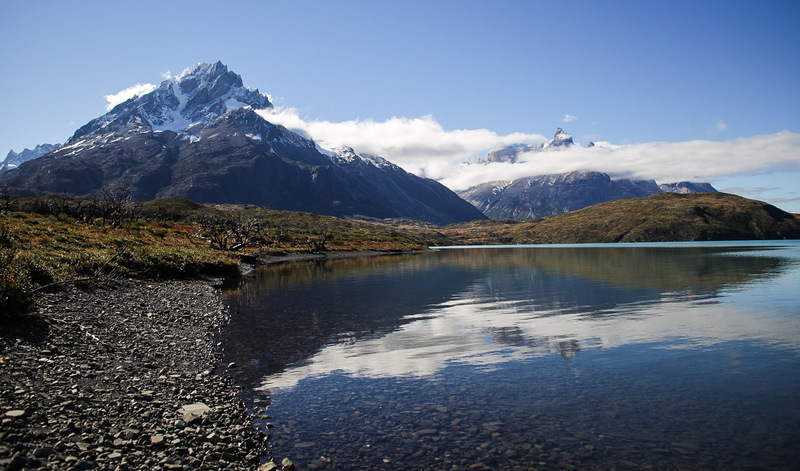 I had already scheduled 11 days until a flight return to Natales. So, I proceeded first day, alone. 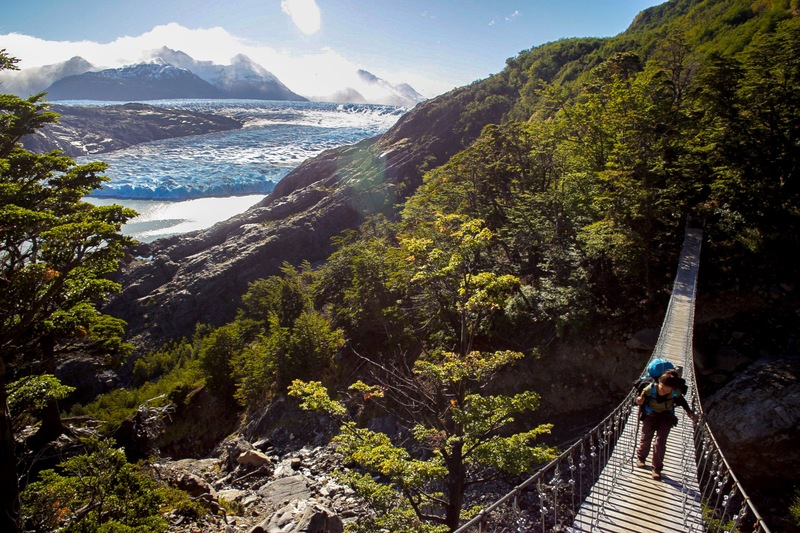 In Torres del Paine, there are a few trek options. There is the “W” which is the shorter version of the “O”. 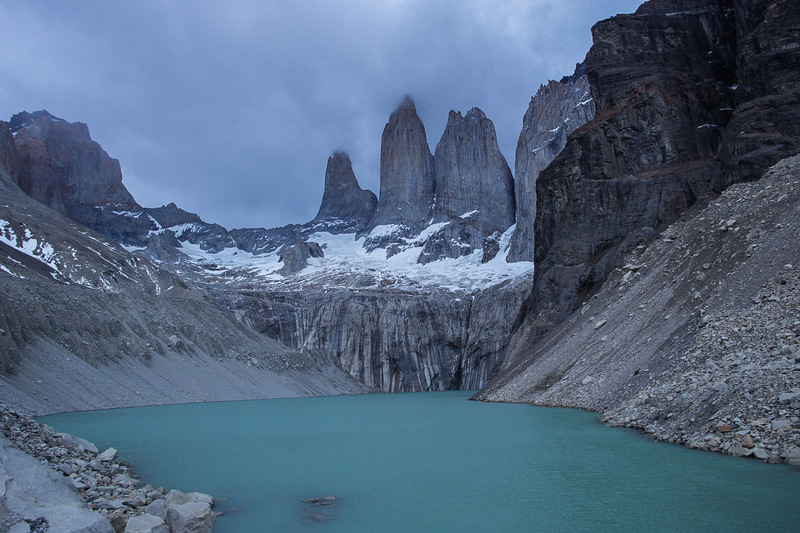 The “W” is usually 5 days trekking the highlight parts of the park, like Valle del Francés and the famous Torres towers. It’s also the park that’s packed with tourist ranging from inexperienced or on a time limit. 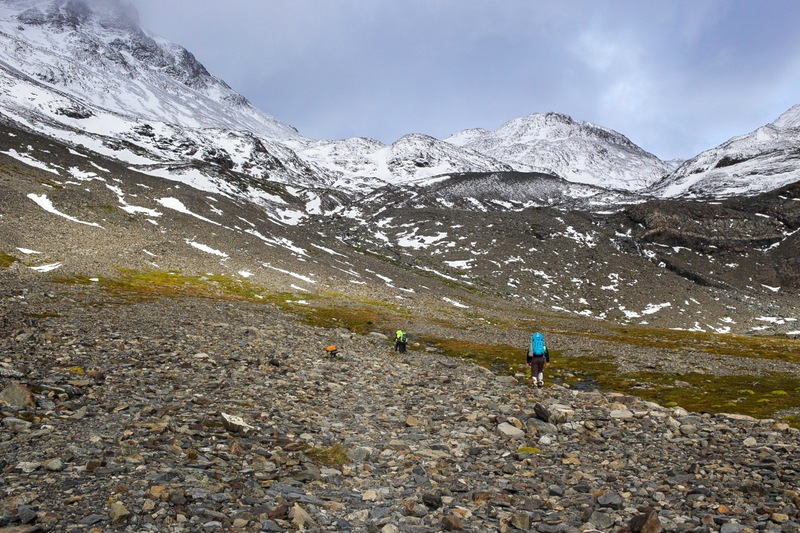 The “O” explores more of the north, behind the mountain group, and there is a challenging pass, the John Gardner. 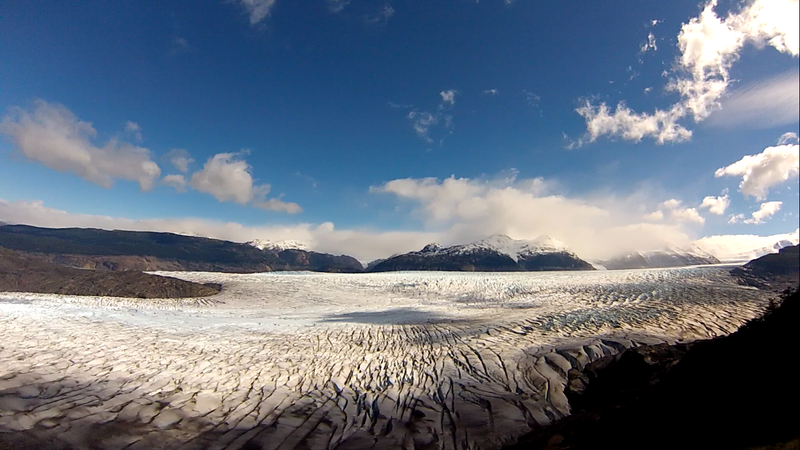 After that pass, lies the entire Glacier Grey field, 270 square kilometers, and 28 kilometers long. They say the field is not always entirely visible, but we were lucky that day. Over this field the Patagonian the rainy and cold conditions generate random weather conditions, and the field is usually shrouded in clouds. I had in mind to make the fullest circuit possible, the “Q”, but according to the map, I would need exactly as many days as I scheduled in Patagonia, it was tight. And without a cooking stove for over a week… I was not sure if the “O” was a wise decision, already. Well, it all came to be that “we” made the entire “Q” trek. At noon, on Day 1, I met Maarteen, a Belgium guy-turned-US American-citizen from New York to California. 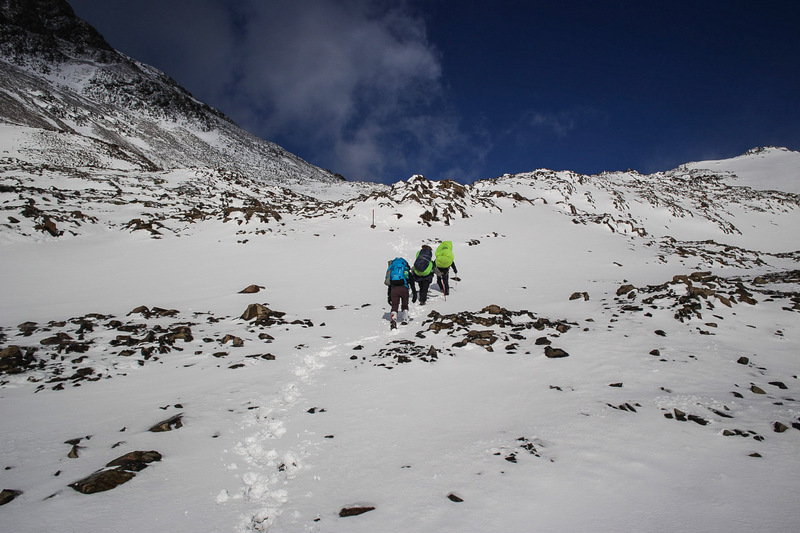 Maarten and I joined forces to hike the entire “Q”, 130 kilometers in 8 days. Not bad, considering the suggested itinerary was 10/11 days. We stuck together, which I was thankful to have his company- many laughs and cooked food! A European with the critical sense of a New Yorker; it was a week of amusement as we secretly ridiculed the Europeans and North Americans. We couldn’t refrain ourselves from laughing at the the trail mix of international walking-stick-“Freds“. Identifiable, from the moment they greet you “Howdy!“. My most memorable day was the hike over the John Gardner pass. As you can see in the photos, many highlight that brilliant day of clear sky, making the pass and a big giant ice field- Glacier Grey. There was a fuss about the pass being closed if the conditions remained like the night before, of furious rain and wind. 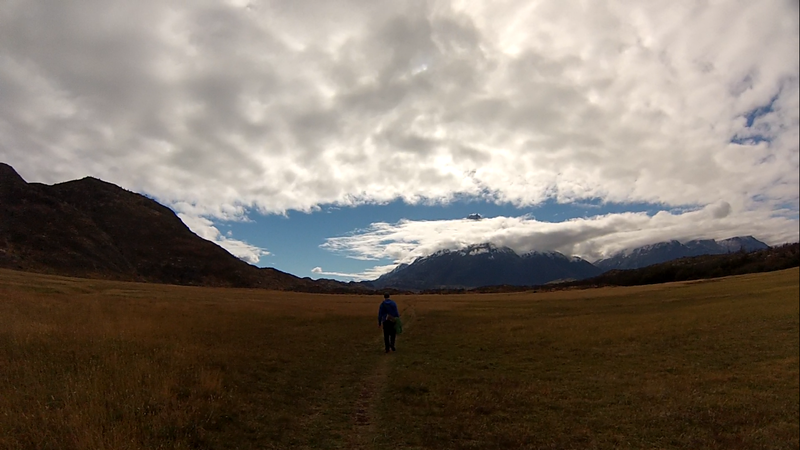 That night before, we were the last to arrive to the basic refuge hut, before the rain poured. A few identifiable groups inside; there were the young Chilean guys, the old Frenchies, some strange mix of North American and Germans, and then us, Maarten and I, team -‘California’-. 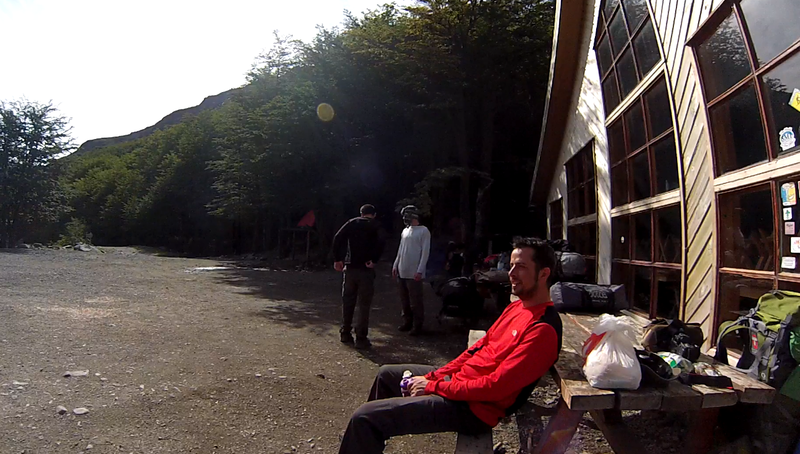 We shared beers with the Chilenos and we all crashed the floor of the refuge hut, breaking the rangers “orders” (But it’s not like he cared!) for we were sane not to go sleep under the rain, like the others. 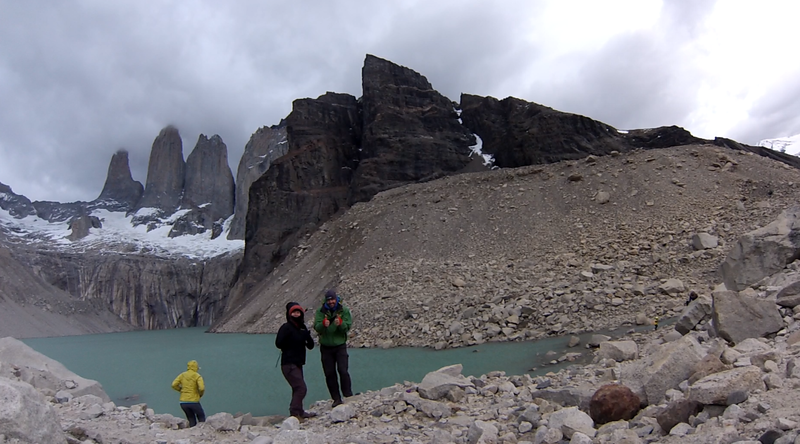 The next day, together with the Chilenos, we were the first in the group to make the pass, early in the morning, and enough time to have lunch next to the glacier valley. It was, so, ideal. 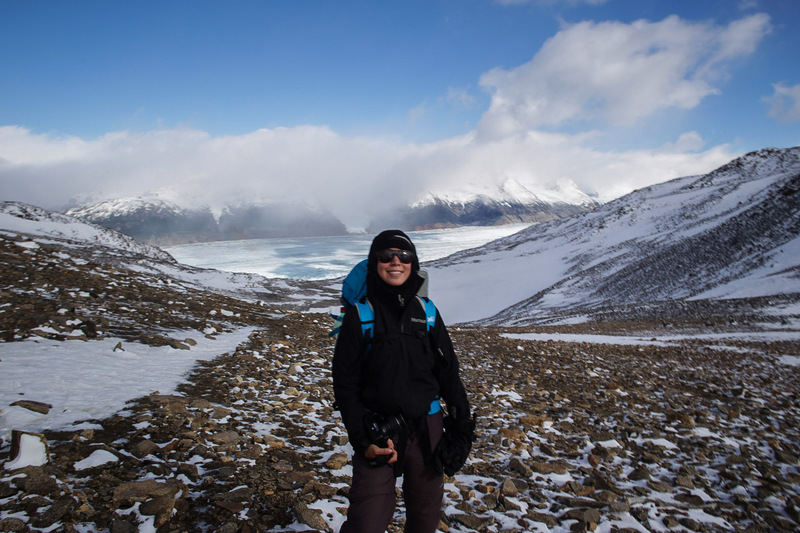 A perfect clear sky and no clouds, the entire ice field was visible for the remaining day, as we hiked down to the Lago Grey camp. We got lucky with weather, for we had many sunny days. Not lucky, because mice and humans stole our snacks- all the best snacks! It was only by day 4 and 5 that our food bag was near empty. Not severely without food, since there were shops on the “W” trek of overpriced snacks. But the upside to the “W”, were the few folks who kindly donated their extra food to us. An Australian couple, Mandy and Lawrence, whom we saw throughout the rest of the trek, were sweet folks who helped us out. We all combined our kitchen to share meals. We cheered with a few beers and pisco sours. The result of mishap and shared bench spaces, brought the chances to meet some very wonderful people, whom I hope to see again. Now, for the collection of photos I was able to make from the videos and snaps from Maarten. Thanks Maarten, for sharing. Morning goodbye to Jork and Sarah. 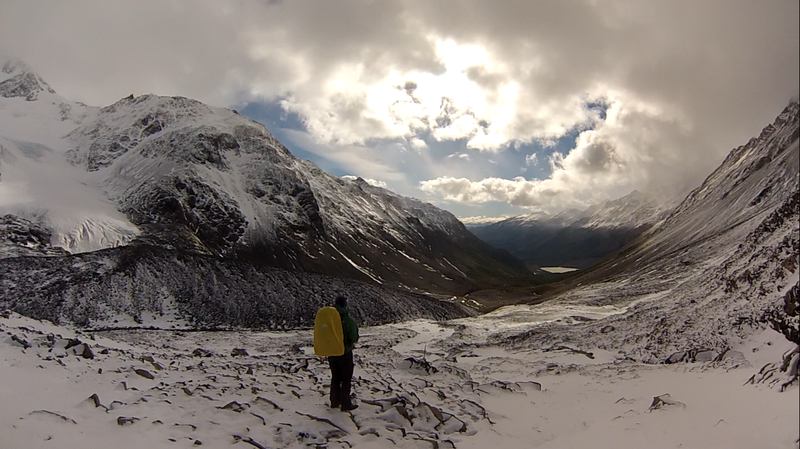 Maarten looking back at the valley before the pass. A few hours later, afternoon, and continuing great weather! Some more hours later, the sun sit low over the glacier. Team California had 2 hours til camp Lago Grey. Just as expected, overcast with chance of rain had arrived by day 4. 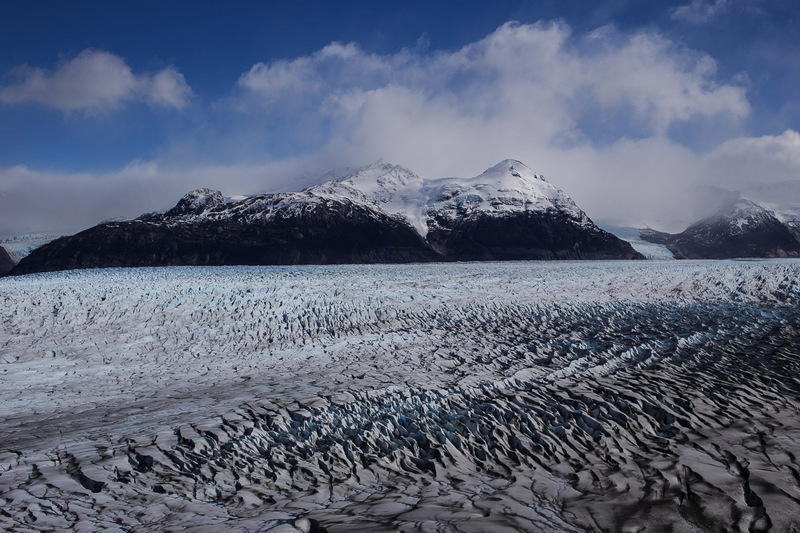 Although, the bleached white sky couldn’t hide the colors of the Patagonian fields. Yellow, red, green and various shades of blue seemed more vibrant with the absence of light. To make the tail of the “Q”, we had to make a 5 hour round-trip hike. 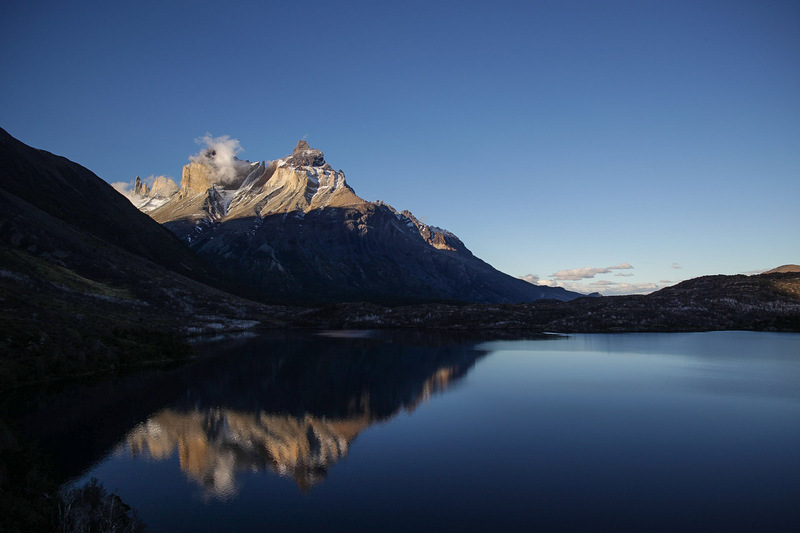 In the photo, we were at less than 100 meters elevation, which made for an impressive view at the 2,800 meter peaks shooting up into the sky. From Italiano, today was a hike up the Valle del Francés. A highlight leg of the trek- no wonder why. 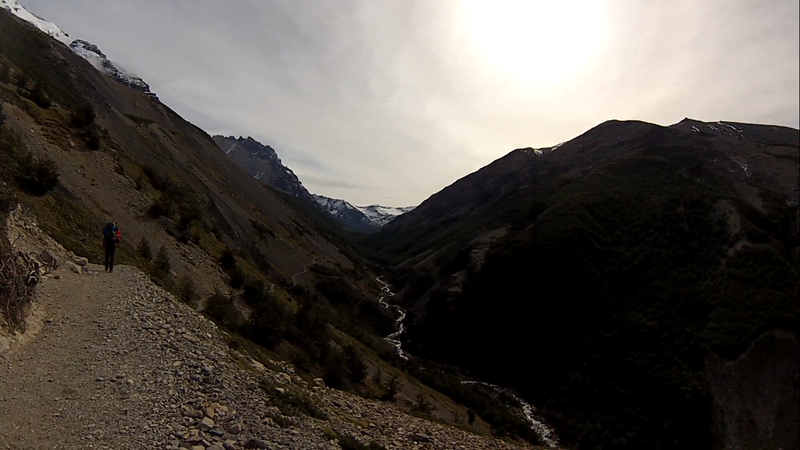 Our second to last day hike meandered into a valley, and finally up into camp Torres. The last morning was the earliest morning for us. We hiked up in the masses for the big special moment of sunrise over the Torres towers. Well, another day of bad weather had cancelled that mornings show. No glowing towers for team California. That’s alright. We were quite satisfied with our trek. Food was replaced, had great weather for 90% of the time, saw the glacier field and earn bragging rights for making the “Q”. The heavy winds kicked in, so we left, down the rocky mountain, to have a few pisco sours with our Aussie friends in the refuge while waiting for the rain to subside. 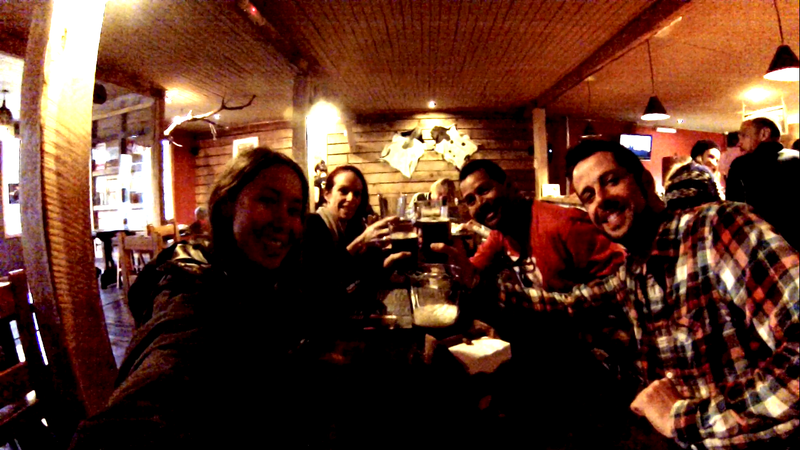 Back in Puerto Natales, we rewarded ourselves to the prize we have been waiting for all week… burgers and micro-brewed beer! Best thing I ate all week. Cheers to Maarten, Mandy and Lawrence. I boarded a bus back to Punta Arenas. 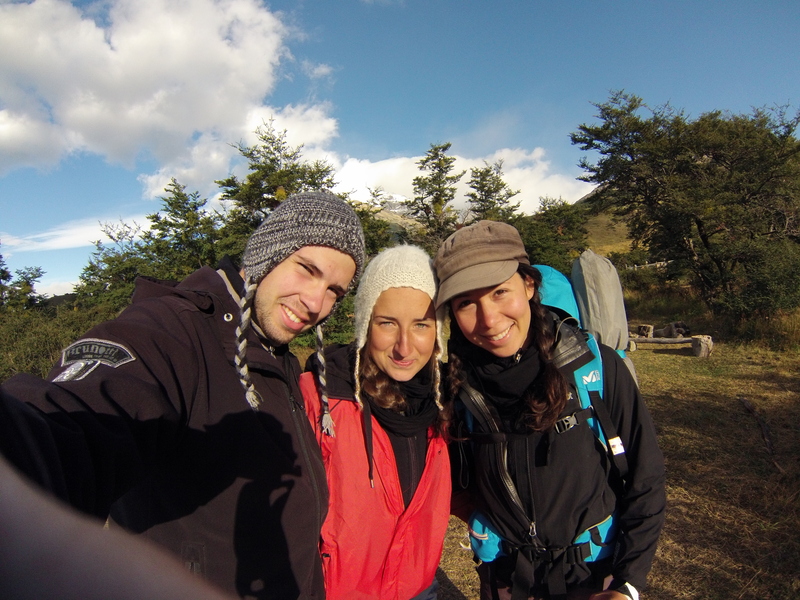 Maybe I will have a couple pics from my Couchsurfing friends, soon. 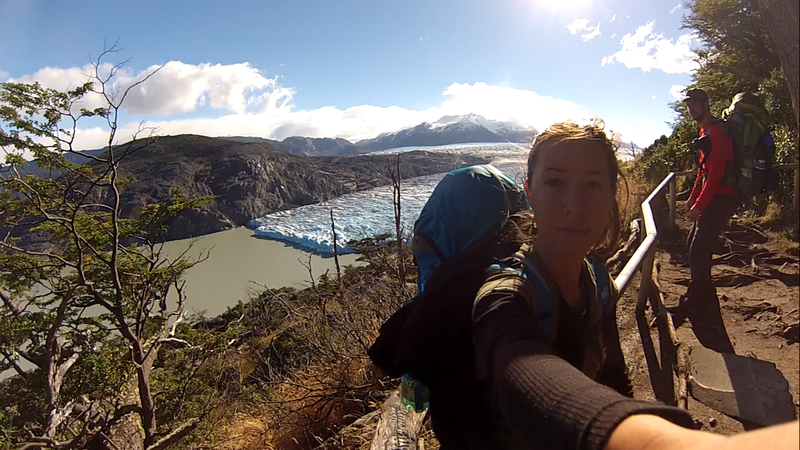 It was a 24 hour stay in Punta Arenas. A lovely, windy city. Now I rest in Puerto Montt. And so far, plans are to return to Santiago, and board a plane for the States. I am not sure how I can describe what I feel, at the moment. Thanks to those who have been with me on this trip, by reading up on my post updates. It’s amazing that I could thank you all for reading over the two years. I’ll have a couple other post following the conclusion of the tour. 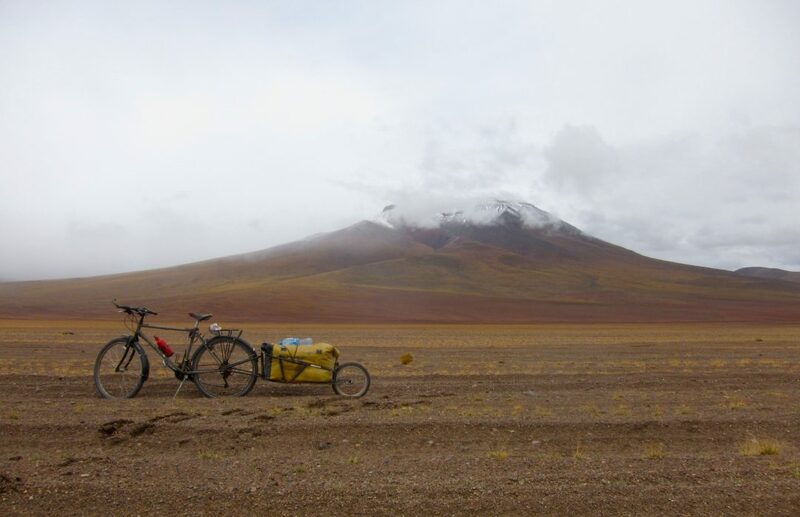 Previous: Previous post: For my next tour, I will cycle from Chile to the Moon, 2020. Donations and support welcomed!